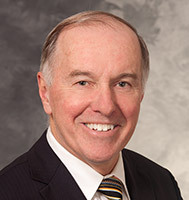 Dr. Robert J. Dempsey, MD, is the Manucher Javid Professor and Chairman of Neurological Surgery at the University of Wisconsin School of Medicine and Public Health. He specializes in cerebrovascular surgery and has extensive experience in the neurosurgical management of intracranial aneurysms, arteriovenous, vascular malformations of the brain and brain tumors. Dr. Dempsey is a nationally recognized expert on carotid endarterectomy. Currently, Dr. Dempsey has multiple R01-funded research projects with a focus on cerebral ischemia and the repair of the injured brain. He has published more than 200 scientific articles on these subjects. He has been a principal investigator of grants from the National Institutes of Health, Veterans Administration and the American Heart Association, leading a group of neurosurgeons and scientists dedicated to improving patient care. In 2007 he was named principal editor for Basic Science of Neurosurgery, the largest circulation medical journal in the field. Dr. Dempsey is an educator and mentor of medical students, residents and fellows worldwide. He has twice been awarded the Clinical Teaching Award by UW students. He has been a visiting professor at multiple colleges and is presently the course co-director of Research Update in Neuroscience for Neurosurgeons. He is also an officer of the major organizations involved in neurosurgical education, both in the U.S. (past president of the Society of Neurological Surgeons) and internationally (chair of the Foundation for International Education in Neurological Surgery). For more than 20 years of service, teaching and operating in developing countries worldwide, he received the Humanitarian Award from the American Association of Neurological Surgeons.